Less than two years after China's first high-speed railway went into operation, China plans to construct a high-speed railway system that will travel across Asia and Europe by 2025. The project will involve 17 nations. Southern route - Kunming in Yunnan Province, Southwest China and runs south, as far as Singapore passing through Myanmar, Vietnam, Cambodia, Thailand and Malaysia. ﻿﻿Even by Chinese standards, the plans seem mind-boggling. The first long-distance line inside China, linking inland Wuhan to coastal Guangzhou, opened in December 2010, hitting top speeds of 350kph, faster than the speediest trains of Europe or Japan. Beijing hopes to have 800 bullet trains running across China by 2013 and, soon after that, across the border. Two networks will connect China to Europe—with terminuses in London and Berlin—and a third will link to Vietnam, Thailand, Burma, Malaysia, and Singapore. Chinese engineers have begun work in Burma, and Beijing says Central and Eastern European countries are keen for the building to start. The planned rail deals will vastly improve China’s ability to transport crucial energy resources from suppliers in developing countries. China will obtain major benefits from this ground-breaking project, which will carry mostly cargo transportation. The second route will serve as a new "Silk Road" for China's western regions. It will bring tremendous trade opportunities and wealth to under-developed Central Asia which has been outside the global economy for centuries. It will enable China to tap into opportunities and resources from the resource-rich Central Asian region reducing dependence on other overseas suppliers. It would also provide a direct route for natural resources especially oil and gas, from Myanmar, Iran and Russia. Nations along the three planned routes are being offered all kinds of lures to agree to the high-speed lines. Cash-poor Burma's high-speed rail network is being built in exchange for raw materials for export to China, such as lithium. Central Asian economies that pump gas and oil to China are also being given financial assistance. So China might just be able to pull it off. The new Iron Silk Road would also provide China with direct access to Middle East and Eastern Europe without using the sea lanes. This would mean that China could depend less on the narrow and congested Malacca Straits and the Indian Ocean and South China Sea. It would also mean that China would not come up against competition with the US who controls and guarantees security of the sea lane trade routes in Asia. There are still many challenges to overcome such as discrepancies in track gauge, line direction and expense allocations are under discussion with the related countries. However it seems that boarding a High-Speed Train in Beijing and arriving in London 2 days later may yet become a reality in 2025. 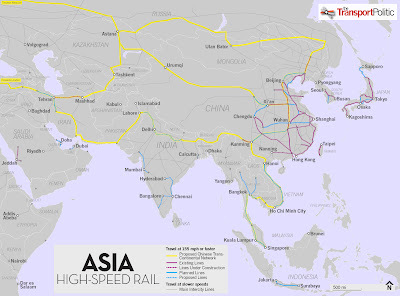 China has already developed high speed trains to a remarkable speed of 350 km per hour. It has the fastest high speed train network in the world. But China is continuing to experiment with High-Speed Train velocity and its aim is to deliver trains with speeds of 500 km per hour in less than 5 years time (2015). Engineers and scientists are continually working to develop even faster trains with speeds of up to 1,000 km per hour that would be operational in 10 -15 years time. If that happens, China will revolutionize the whole transport industry. With trains travelling at such speeds new innovations for boarding and alighting will also be necessary as suggested in the video above. It seems to me that Europe decided long ago that conservatism was the best policy in order to maintain stability and growth, but we shouldn't forget that risk taking enterprise is what made Spain search for a new route to China and Southern Asia away from the established sea routes controlled by the Portuguese. The result of this brought the discovery of a new continent and great period of economic growth which took Europe from the Middle Ages into what we like to call "The Renaissance". And the same could be said about the industrial revolution and how ideas and new technology could bring social changes beyond anything that we could have predicted back in the XVIII century. I think China's vision is admirable. May be the time for conservatism in Europe has passed, or may be it's time for us to go back to the Middle Ages again... It wasn't so bad, was it?